How much money you'll need will depend on a variety of things. 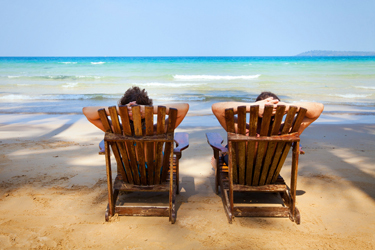 Have you got a plan in mind for when you retire? Is it to travel overseas, hit more balls on the golf course or spend time with family and friends? Whatever your goals, you’ll need to have a plan for how you’re going to get there financially. As a guide, the Association of Superannuation Funds of Australia (ASFA) suggests couples around age 65 will need $59,000 a year and singles will need about $43,000 in today’s dollars to live ‘comfortably’. (i) Now this is assuming you’re in relatively good health and that you own your own home. On this budget, you should be able to afford things like a new car, private health insurance, to dine at quality restaurants and have local, and some overseas, holidays. By comparison, a ‘modest’ yearly budget of around $34,000 for couples or close to $24,000 for singles would provide a more basic lifestyle. (i) This means you’d probably have to keep your older appliances and car for a bit longer, eat out less frequently and generally stay locally for holidays. Will I have to work longer or do something else to generate an income? Once you’ve considered these questions, think about ways to give your financial situation a boost while you’re still working. If you decide to sell or downsize assets, such as your home, make sure you check what the tax implications are and whether it will affect your eligibility for the Age Pension. Find out about what changes are happening to the Age Pension assets test from 2017. It's also important to note that the Federal Government proposed a number of changes to superannuation in the 2016 Federal Budget, which may progress to legislation. You should seek financial advice before making any decisions regarding additional super contributions. ii 30% if you earn over $300,000 per annum. iii These contributions will count toward your concessional contribution cap. The concessional contribution cap is currently $30,000 (or $35,000 for those aged 49 and over on 30 June 2016).